1. Finding out someone's structure or grammar skill before studying the them. 2. 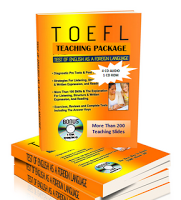 Checking how far TOEFL Test Takers have mastered grammar. Now set your clock for 25 minutes. This section is designed to measure your ability to recognize language that is appropriate for standard written English. There are two types of questions in this section, with special directions for each type. Directions: These questions are incomplete sentences. Beneath each sentence you will see four words or phrases, marked (A), (B), (C), and (D). Choose the one word or phrase that best completes the sentence. Then, on your answer sheet, find the number of the question and fill in the space that corresponds to the letter of the answer you have chosen. The president _________ the election by a landslide. The sentence should read, “The president won the election by a landslide.” Therefore, you should choose answer (A). The sentence should read, “When did the doctor attend the conference?” Therefore, you should choose answer (B). 1. In the early 1 900s, Eastman _____ inexpensive Brownie box cameras. 2. _____ the discovery of the fossilized remnants of tides in one-billion-year-old rocks. 3. The Brooklyn Bridge _____ took thirteen years to complete. 4. Genes control all of the physical _____ we inherit. 5. Indigo can be extracted from a plant, and then _____ to dye cloth blue. To get the answer keys, click here. kok gak bisa download gan?